The last line of dialogue spoken in “Escape Plan” is “haven’t I suffered enough.” A perfect summation of my feelings after sitting through two hours of an uninspired, illogical slog that takes itself way too seriously. 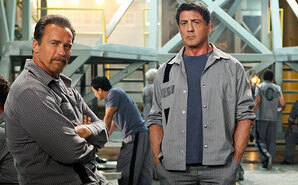 Ditching any of the fun that helped make Sylvester Stallone and Arnold Schwarzenegger action behemoths in the 80s and 90s, their first ever co-headlining endeavor (the “Expendables” films supplied a nice bit of novelty, but they barely share the screen) is a procedural that is less interested in procedure than it is talking about procedure. By the time the aging heroes pick up firearms and execute their daring escape, none of it matters. Worse, none of the action registers the slightest of blip of excitement. 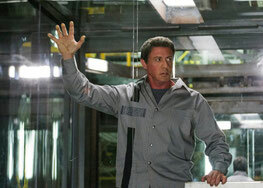 Stallone is Ray Breslin, a professional-prison-breaker-outer for a security firm that locks him up in high security facilities to test their escapability. As his partner Lester (Vincent D’Onofrio) helpfully points out in his weird East Coast accent, there isn’t a prison built by man that Ray can’t escape from. An elaborately staged and way-longer-than-it –has-to be opening sequence shows Ray escaping from a Colorado prison using wet toilet paper, plastic lining from a milk container and astute attention to the guards’ cigarette breaks. Director Mikael Håfström is comically fascinated with the pack of cigarettes, showing it often to let us know it MEANS SOMETHING. Breslin escapes, and then goes through his process step-by-step for the warden. This is pretty much the level of vision throughout “Escape Plan.” Ray and his team, which also includes handler Abigail (an underused and bored Amy Ryan) and tech genius Hush (a barely but still overused Curtis “50 Cent” Jackson) are approached by a CIA agent hoping the expert will test a new high-tech facility that is “off the books.” Ray accepts despite the protests of Abigail and Hush, and is tossed into “The Tomb” – a privatized prison where prisoners are kept in glass cubes and guards wear faceless black masks. Breslin is quickly approached by the mysterious Emil Rottmayer (Schwarzenegger), who’s eager to forge a friendship and the pair quickly begins planning their escape…plan. Though the duo may not be able to tote exploding arrows or machine guns like they used to, the premise offers an opportunity for entertaining collaboration, but unfortunately it’s not realized. The script is only concerned with hitting necessary plot beats, logic be damned. The two discuss guard habits and latitude/longitude coordinates, but their plan basically comes down to convincing a sympathetic prison doctor (Sam Neill) to help them, and playing nice with an Islamic extremist inmate who turns out to be a pretty good guy (Faran Tahir). Get a couple favors, make a couple well-timed computer keystrokes, get a gun and shoot at some guards and BOOM, any prison is escapable. As Warden Hobbs, Jim Caviezel appears to be having fun playing the ruthless but refined prison overlord; though it is weird he built his fortress using Ray’s published works and idolizes him yet doesn’t recognize him when he’s tossed in the facility. A facility that is supposed to house high-level gangsters, warlords and terrorists, but based on what we see everyone looks straight out of prison movie central casting, complete with thuggish face tattoos and the like. Of course there are twists that involve why and how Breslin and Rottmayer became locked up in The Tomb, but they aren’t hard to see coming and are all literally handled with a few pieces of dialogue in the film’s final five minutes. That’s the mantra of the film it seems – explain and explain and if something doesn’t make sense, just explain it away. Or try to distract with a punch to the face. Or confuse with Arnold Schwarzenegger screaming wildly in German. That happens.